Cedric Mutebi was 18 and barely out of his freshman year at Wayne State University when he was confronted with the gravity of the public health challenges that shaped his professional ambitions. Volunteering in a Detroit Receiving Hospital emergency department program that provided Detroit residents free testing for a variety of diseases, the aspiring physician had the difficult job of delivering unthinkable news to a young man barely a year older than him. “He had come into the emergency department with some symptoms and was just trying to get treatment,” recalled Mutebi. “It turns out that the symptoms were from him being HIV positive. For me, in that instant, looking at this young black man who looks like me and having to tell him that he had HIV, my experience went from being someone who just wanted to do this work to someone who was now in it. While many young men and women dream of changing the world, Mutebi already has a head start making an impact — on Wayne State’s campus and beyond. Now 20 and in the middle of his junior year, Mutebi is something of a standard-bearer for excellence at the university — a source of pride, affirmation and high expectation. He can be seen in promotional video clips, on posters, in online images and numerous other vehicles celebrating the Warrior Strong ethos. 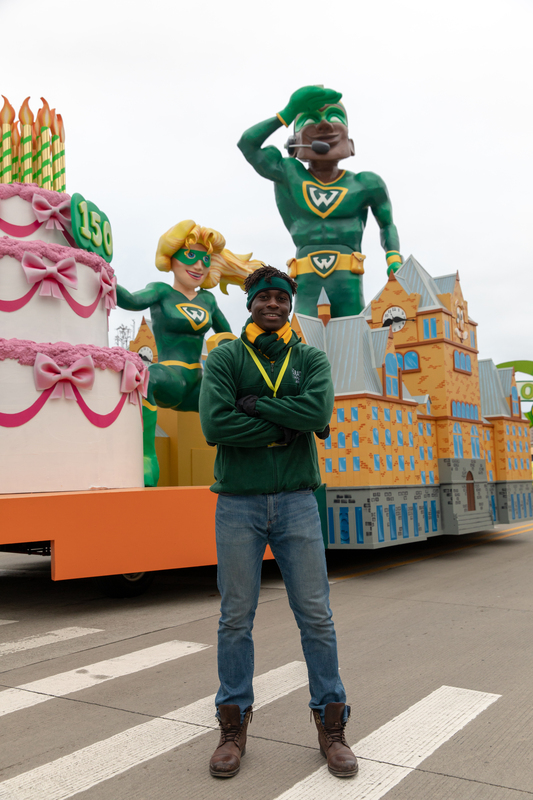 In November, Mutebi rode the WSU-branded float at the annual America’s Thanksgiving Parade. Less than a month later, he was chosen to be the first student to pose a question to former first lady Michelle Obama during her impromptu meeting with a group of young black men from Wayne State. Meanwhile, Mutebi’s influence across the university has been as ubiquitous as his face. A scholar in the top-flight Wayne Med Direct program — the cutting-edge initiative puts its high-performing participants on a fast-track to M.D. programs by embedding the students in the School of Medicine community during their undergraduate studies — he recently led an effort to train 1,040 people in CPR as part of the university’s participation in the statewide Hands-Only CPR Challenge. The success earned the university first place in the competition. Mutebi also works closely with multiple on-campus mentorship efforts. He helped found The Brotherhood, an organization of young men of color, in which he and other members offer tutoring and mentoring to children through the Downtown Boxing Gym Youth Program. He’s an active member of Wayne State’s Warrior VIP program, a universitywide effort to provide wraparound services to encourage student success, and the celebrated male learning community The Network. He works with Provost Keith Whitfield on new community engagement strategies, and sits on the board of the American Heart Association Heart Walk Cabinet. nurse who immigrated from Uganda to the U.S. with Mutebi’s accountant father in 1989 — with an overseas relief program she established nearly 15 years ago. The nonprofit program, Opening Doors, assists Ugandans who are battling learning disabilities. Mutebi has helped his mom with the program since he was about 8. “Opening Doors is more than a nonprofit — it’s really a home for children with learning disabilities and physical disabilities,” he said. “In Uganda, when people have kids who are disabled, they can feel like God is punishing them for something they did, so those kids are often times pushed to the side, mistreated, neglected. Our facility is a place where these children can go without feeling stigmatized. While such ambition may be what drew Mutebi to Wayne State, he admits that the decision wasn’t exactly cut and dried. A top-notch football and basketball player while attending University of Detroit Jesuit High School — his brother, Nick Mutebi, played basketball at Wayne State for four years — he earned a number of college athletic scholarship offers, including a roster offer from the University of Michigan football team. Things began to change after a family friend brought Mutebi to campus and facilitated a personal meeting with President M. Roy Wilson. When Mutebi later learned that he had been accepted into the Wayne-Med Direct program, he made the difficult decision to forego college sports in favor of full-throated pursuit of a career in medicine.